Are you ready for an adventure? Then why not take a group of friends to Madrenaline. Here you will find activities such as Clayzar Archery, Sphereing and Sky bow. This is said to be one of the best Segway obstacle centres in the United Kingdom. You will most likely come across muddy tracks and winding woodland paths as it is set in 160 acres of a working farm. You will also see a privately owned country house. You may even bump into a few sheep or cows along the way. Why not try the Slalom course, which is said to be challenging with bumps, humps, rope bridge and see saws. You may fancy the Harness and Aqua sphereing, which seems to be the most common activity. This involves rolling down a hill at about 30 mph in a very large ball. This is described as awesome! 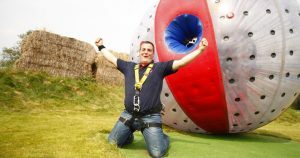 There is room for two people to climb into the ball, complete with full body protective gear. They are then pushed down the hill. It is not for the faint hearted, but it is a gentle ride. Aqua Sphereing is the same as the activity above, but there will be about 50 litres inside the sphere with you. Prepare to get extremely wet. There is a new sport in town too; the Laporte Sky Bow. If you like archery games this may be the one for you, with a difference. To make it harder the targets are moving about in all directions. If archery is not your strongest sport, but you still want to have a go, there are expert instructors on hand to get you knocking down those targets in no time. Clayzar Laser Clay Pigeon Shooting is one of the greatest thrills. Shoot down those clay pigeons with a deactivated 12-bore shotgun that uses lasers. To shoot the clay pigeons it’s easy as all you need to do is aim and fire. Go with a group and get expert tuition to enjoy a wonderful shooting experience in safe and controlled conditions. Having decided that you are indeed an adrenaline junky, and want to experience these great activities, you may need to get transport to get you there. Today there are many choices, but the best is booking a minibus compete with your own driver. Manchester minibuses have arranged the perfect trip for you at £200, which includes a vehicle that will hold up to 16 of your friends. This includes your return journey home, too. So, what are you waiting for, book a day to remember, without the stress of driving yourself.